A webmaster not only have to ensure that his or her websites are always up and running without too much downtime, but also the speed of the web page loading time. So other then monitoring the uptime and continue availability of the web server, a webmaster should also test and check the website load time or the speed of the web server used to search a visitor a web page, as slow page load will drive users away. 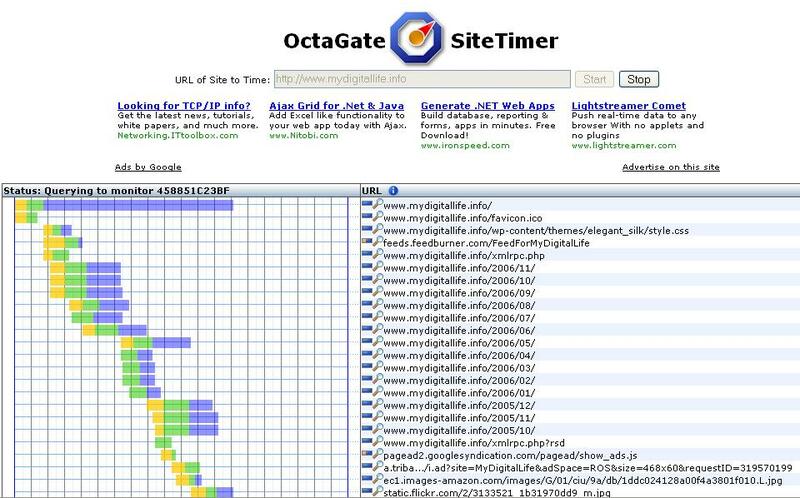 OctaGate SiteTimer is a free web monitor service that can be used by webmaster or developer to monitor how long it takes for a user or visitor to download one or more web pages from the web site. As the target testing pages are downloaded, SiteTimer stores statistics on how long time each item takes to download, and how much data they contained. The the collected information and measurement is delivered to the originating web browser by responding to the AJAX requests, and be presented on a grid with colored bar shows start time, connect time, time of first byte and time of last byte for every element on the website, in which webmaster can have an accurate indication of time a real browser would spend downloading the content of the specific web page. Check your websites loading time with OctaGate SiteTimer.